A little over a week ago, as the GOP dominated Pennsylvania House was wrangling over what to do to achieve an almost six month late budget freshman Democratic Governor Tom Wolf might finally sign, a move was made to revert to a budget approved by the also GOP controlled Senate, known as the “framework”. That general fund budget included $30.8 billion in spending, along with marginal pension and liquor reform, but not the tax increases necessary to pay for it. Nonetheless, having given up on a move to send the Governor a stopgap emergency budget that he promised to veto, an attempt was made in the House to set the Senate bill up for a vote. When it was approved by just one vote 100-99, someone told Rep Daryl Metcalfe that one of the yes votes was cast by Rep Peter Daley, who was not on the floor. On a subsequent motion to reconsider, Rep Metcalfe, a Republican, observed Democratic Rep Mike Schlossberg pushing the voting button of Rep Daley. This prompted Metcalfe to inform the Speaker, who ordered all members to be in their seats for further votes. Very quickly the word got out, with tweets claiming “ghost voting” and suggesting that for Schlossberg it’s one man, two votes. Several media outlets reported on the ghost voting. At no point, on social media, did anyone defend what most saw as shocking, immoral, dishonest behavior. As it turns out, a total of three votes were cast for members not present in the hall of the house as the rules require. In the case of Democratic Rep Leslie Acosta, she was reported to be in Nicaragua. Republican Rep John Maher claimed he was just steps away due to business in his capitol office, and had his vote cast for him as a courtesy. The following day I was in the capitol. Being an occasional visitor, in talking to several trusted friends who are there much more often, in a short period of time I heard some very revealing stories about ghost voting. First, they all agreed that ghost voting is not a rare event but common practice! It’s one of those things where, in spite of a rule against it, everyone looks the other way. Beyond this revelation that would shock the average citizen, who would likely question the practice as a serious breach of the public trust, I was told of a practice where legislators sometimes rig their voting devices with pennies to cast a vote for them when off the floor. Then sometimes they forget to remove them! If this doesn’t sound like high school, it gets worse! On the Senate side the rules allow voting for an absent member, but only when on either capitol leave for business within a 10 mile radius of the capitol, or legislative leave, for business within their home district. I imagine an example of capitol leave may include appearing at Dauphin County District Attorney Ed Marsico’s office to be charged with a crime. Even so, when Senate votes are cast for a member on appropriate leave, they are required to be cast by the floor leader of that member’s party and no one else. Yet as I was told, sometimes the leave type is changed for a member prior to a vote to make it legit. One known story that goes around is of a Senate member tweeting pictures of himself from an Atlantic Ocean beach while on legislative leave, and yes, having a vote cast on his behalf! Rep Metcalfe has called for a House Ethics Committee investigation. He also wants to see house rules changed so members could move to invalidate votes where rules have been broken. While this makes sense, the Senate likewise should take a look at its rules regarding voting. If there’s good news in all of this, it’s that someone got caught in the act where the outcome of a vote was possibly affected, and the practice has become publicly known. It presents a real opportunity to clamp down on behavior that no one has tried to defend, making reform in short order a likely possibility, if (and here’s the if) the issue is not allowed to fade from the public discourse. Make no mistake. Everyone wants this incident to be behind them. A representative of House Democratic Leader Frank Dermody’s office told me today that House leaders from both parties have discussed the ghost voting issue over the past week. Being the type of thing that can quickly fade from people’s minds, silence can quickly open the door to do nothing, allowing continuance in a comfort zone of corruption. Constant reminders from an aware public, on the other hand, will likely result in quick action. On this one, ordinary citizens hold an unusual amount of power. Before retirement I was politically interested but not so much politically involved with the exception of the healthcare issue, for which I had a fascination going back to Hillarycare days of 1993-94, when I pounded out letters to members of congress and various organizations on a manual typewriter and sent them snail mail, arguing for medical savings accounts and less third party payment. Of course, that issue died down for a long time. By coincidence, I retired at the end of 2008, between President Obama’s election and his inauguration. My old interest was quickly rekindled as I followed the events leading up to what we today call Obamacare in March 2010. I began writing on the subject again, offering innovative solutions that since have evolved, so that even I don’t support many of those early ideas. The push to citizen lobbyist came in early 2011 when I showed state Senator Folmer a piece I had written at a class on the Constitution he was teaching. Despite trying unsuccessfully to get the ear of anyone, for which I thought were some good ideas, Senator Folmer demanded that I come to his office to meet with him! Wow! I made the appointment. Then I felt the pressure. I dug and dug more and printed what I found. I showed up at his office with the two pages that had sparked his interest plus 50 pages of “supporting documentation”. We met for almost two hours. He and his staff were impressed with my preparation and I was on my way. When I expressed that I wanted to just get some things done so I could go back to being retired, they suggested that my involvement would linger and move to other issues. They were right. Without any formal training I threw myself into the game. Now three years later, I know almost every nook and cranny of the Pennsylvania state capitol. Many legislators and even more staff know me and generally they respect that I bring issues of substance, with well reasoned arguments, for or against topics on which they may agree or not. I shop ideas, and that’s important. When I disagree I always try to have alternate suggestions. Learning to disagree amicably is part of the way it works. Getting personal, playing gotcha, or attempting to embarrass to their face or behing their back, is picked up quickly and results in less access and opportunity to persuade. From my experience I can now offer a few tips. First and foremost do your homework. Know as much about all sides of an issue as possible. This is how to establish credibility. Know which representatives are involved with which issues, to which committees bills have been assigned, and who sits on and chairs those committees. Consider building email lists to feed ideas on legislation simultaneously to all members of a committee so they may talk amongst themselves. I’ve done this locally with my school board. Ask for personal meetings with legislators and staff, and when offered, be respectful of their time and thank them profusely. Play to their egos. Understand politics attracts certain types of individuals. One occasion I’ll never forget is when visiting with a staff person I had gotten to like, the phone rang. Since this was a mostly personal visit, I told the staffer to take the call, that I could wait. While waiting he said twice to the person on the other end of the conversation, “No. You don’t understand. Most of the people in here have a pathological need to be loved.” That sunk in deep. I realized how important it is to exploit that fundamental truth! Always keep that one in mind. Having self written printed material is good. 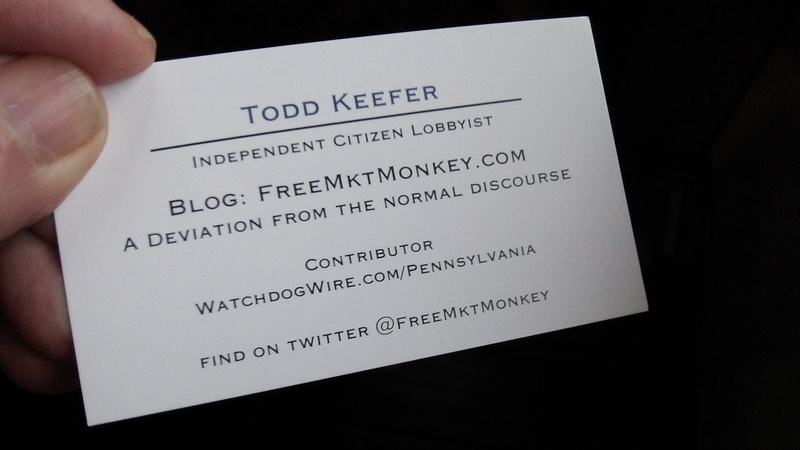 I like to hand deliver copies of articles I’ve published to my blog or Watchdog Wire. It’s important for them to know what you’re giving them is also public and that you may write about them…that need to be loved. Engage them on Twitter and Facebook. Here again you are not behind closed doors. Make phone calls to their offices. Send them emails. Stay in touch. Offer links to stories that may help them better understand issues. Just be aware that no matter the form of communication, it always carries most weight coming from a constituent. Knowing this, it sometimes may be most beneficial motivating a legislator’s constituents to work for you. Business groups or grassroots organizations in their district can be good targets. Explain the importance of their effort and how they can uniquely make a difference, especially when their representative holds the keys to moving a bill along. On the constituent issue, when contacting those who don’t directly represent you by your vote, be upfront. Say you are not a constituent but remind them that in their capacity as chairperson or member of a committee where legislation resides they do represent you and all citizens of the state. It can often be very difficult to get private sit-down meetings with representatives outside your own district, but there is one important trick that often works. Attend committee meetings. Usually in the time just before the meeting commences, and again after it adjourns, opportunity presents itself to go one on one. Introduce yourself. Share a handout. At one meeting I attended the chair gave me permission to place a handout at each legislator’s seat prior to the start of the meeting. It is sometimes these introductions that can lead to a willingness to meet more formally. Never hesitate to ask. The most they can say is no. Another important step is attending town hall meetings. If you have a good relationship with your elected representative and visit or contact often (and you should), don’t try to monopolize too much time. Learn what’s on the mind of your neighbors, unless its something you want to make the representative address publically. Don’t hesitate to attend town hall meetings outside your district, but admit your status and defer to constituents in the Q & A. Showing this respect will bring you yours. Don’t try to nail elected officials to the wall in embarrassing ways with trick or trap questions. Rather than condemn them outright for taking tens of thousands from a union other special moneyed interest, ask them to tell you, and everyone, how they will avoid being influenced by the expectations attached to the donation, in keeping first the needs of those they represent. That they know you’re aware who their donors are and that you’re watching is what counts. One last thing is don’t despair. Surprises are possible. One idea I shopped, based on exciting legislation in the New Jersey Senate to reward physicians who volunteer time in free clinics, was introduced in the Pennsylvania House by a representative outside my district. This truly proves the power of one. While these tips have been centered on my experience at the state level and I have the advantage of living near the Pennsylvania Capitol, the same basics apply at the federal level on down to local counties, boroughs, townships and school districts. Pick issues of interest, knowing no one can be on top of everything. Throw yourself into it, and have fun too!